This hostel is awesome. Totally safe. Good people. Good atmosphere. Good food. I went on the bike trip which was nice. You can’t go wrong staying here plus it’s right next to the train station. 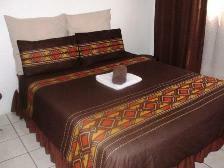 My experience was very good, the staff were friendly and helpful, the accommodation was clean and good quality. The tours provided by this establishment were excellent and educative. My only concerns were that the prices of items did not fully inform you of what they included eg. room only, tour including lunch and a snack. I wish the bathrooms were included within the room. The water temperatures would change when showering. Amazing hostel with a great experience! Professional staff, excellent dinners! Great place to stay in a wonderful community of people. Soweto is very safe and the people are very welcoming and genuine. 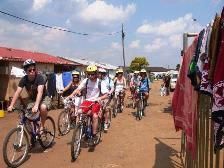 The bike tour was a good insight of the current and past history of Soweto. The lunch and dinner was fantastic I would definitely stay here again! I loved my stay at Lebos. It's one of the places I would have loved to stay longer than just two nights. Great staff, great tour, great food. Thanks to everyone who made my stay to what it was. Lovely people, best way to experience Soweto and learn about the history of the area. It will correct many misconceptions you may have of the place & the people there. Showers and dorms were great. Small kitchen area if you want to cook your own food but great home cooked authentic food available for a reasonable cost. Don't forget your eye mask to help with sleep coz the blinds weren't gr8. I would happily recommend the place with the bike tour as a must do combo with your stay. Happy cycling. Creative and amazing backpackers that offers so much...open fires, African lunch, bike tours and very helpful staff. A real community gem that gives a warm insight for travellers and tourists. Wasn't really explained how everything worked with the hostel. The staff was friendly but seemed more keen to socialize with each other than help out a new guest. The result was badly hurting my foot when I had to jump the gate to catch my early safari pick up because no one was around to open the gate nor tell me that there wouldn't be when I arrived.